Photograph Provided by Dr. Bruce Charnov, Hofstra University, All Rights Reserved. Juan de la Cierva was born on September 21, 1895 in Murcia, Spain. Born unto a wealthy family, as a teenager Juan experimented with gliders. His earliest aircraft experiments began as early as 1912. Juan attended the Escuela Especial de Ingenieros de Caminos, Canales y Puertos in Madrid for six years, earning his degree in civil engineering. Cierva, with his education complete, entered a competition to design an aircraft for the Spanish military. His design entry was a bi-wing bomber that was tested in May of 1919. Unfortunately, the pilot stalled the aircraft and crashed. Juan created a tri-motor airplane in 1918 and had successfully completed three flights in the ship and then it too crashed in 1919. Rather than let this string of events deter him from building aircraft he began a search to design an aircraft that would be independent of the stall characteristics found with fixed-wing aircraft. Following serious investigation into overcoming the stall issues on airplanes de la Cierva started an approach at making the wing move continuously in the relative airstream. His first approach to the problem was to provide a rotational wing and conducted several experiments with rigidly mounted rotors. While these early aircraft had plenty of engineering problems to overcome the basic foundation of his idea was laid and the autogiro was patented in 1920. Juan could see that refinements were needed to absorb the flight loads imposed on the rotor blades and the need to reduce vibration present in the rigid rotors. Most importantly, Cierva realized that the advancing blade was producing more lift than the retreating blade resulting in an aircraft that tended to roll toward the retreating blade side when the aircraft attempted to take off. This was a major finding in controlling the forces acting upon the rotor and the primary reason other inventors had failed to produce a working version of the helicopter. While other experiments of rotary flight tried to power the rotor blades de la Cierva took a more simplified approach in allowing the rotor blades to free-spin or autorotate, with thrust being provided by a propeller. To overcome the lifting tendency of the advancing blade (known as dysemetry or assymetry of lift) Juan decided to hinge the joint at the rotor hub to allow the blades to flap. This would allow the blades to naturally speed up or slow down depending on their position in the rotor disc. He then realized he might have a greater reduction in vibration in he allowed the blades to seek their own lateral position in rotation. Juan incorporated another set of hinges to allow the blades to lead or lag in their position about the mast. The idea not only worked, it worked very well and Cierva could build his rotor blades from strong yet light weight materials that would be needed to get the performance he sought for in his design. With these hinges, at the hub, the rotor blades did not have to absorb all of the stresses imposed on them directly and the rotor design is known as an articulated rotor. The Cierva design articulated rotor was the breakthrough needed for safe rotary flight. 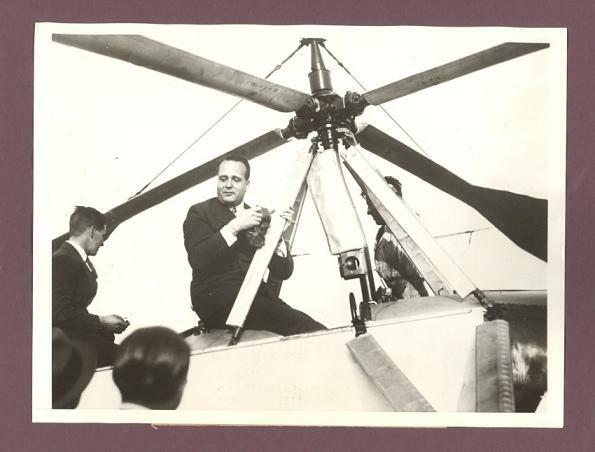 After four years of experimentation, Juan de la Cierva developed the articulated rotor which resulted in the world's first successful flight of a stable rotary-wing aircraft the C.4 prototype. Juan’s initial design goals were quite high. He not only wanted to design and build an aircraft which would not stall, he also wanted to develop an aircraft that had short take-off capability and was able to land in small areas. The Cierva autogiro achieved those goals. The fuselage and empennage assembly was of similar design as to those of an airplane, thrust being provided by an engine and propeller. Lift being provided not by fixed wings but by large rotating airfoils known as rotors, mounted horizontally above the craft and rotated by airflow moving up through the rotor disc. 1920: Cierva C.1: A single place, single engine autogiro with tandem rotors mounted on a single common mast. 1921: Cierva C.2: A single place, single engine autogiro with a single rotor. Similar in design to the C.1 with additional surface area to the vertical stabilizer. 1922: Cierva C-3: A single place, single engine autogiro with a single rotor with bracing wires on both the upper and lower surfaces of the rotors. The world's first practical autogiro flew 200 yards on January 9, 1923 in Madrid, Spain by Lt Gomez Spencer. 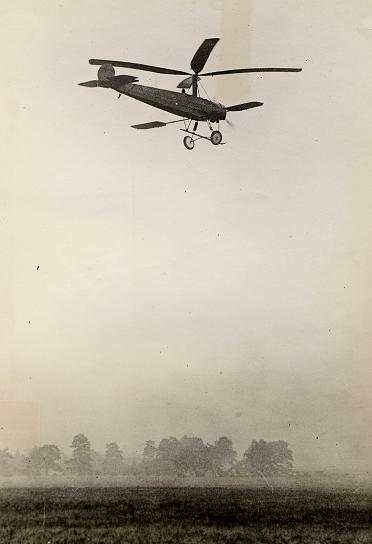 Two days later the autogiro was unveiled to the public and made three flights, the longest of which was flown over a two and a half mile closed circuit at an average speed of 37 mph (60 km/h). The C.4 was a single place, single four-bladed rotor design. Power came from a 110 hp le Rhone engine. The C.4 was quickly followed with a three bladed design in the single seat, single engine C.5. In 1924 Cierva built his next design as the C.6. In 1925, Juan moved to England, where with the support of Scottish industrialist James G. Weir, he founded the Cierva Autogiro Company. Also, in 1925 he brought his C.6 to England and demonstrated it to the Air Ministry at Farnborough. The C.6 had a four bladed rotor with flapping hinges but relied upon conventional aircraft controls for pitch, roll and yaw. The basic structure came from an Avro 504K fuselage, prerotation of the rotor was achieved by pulling a rope passed around stops on the undersides of the blades by a ground crew. It should be noted that Cierva did not fly these early versions of his aircraft. In further designs of his aircraft Cierva did fly as the pilot. On September 18, 1928, he flew one of his autogiros (C.8) across the English Channel, and in 1930, he flew one from England to Spain. Autogiros were used during the 1930s for military liaison, mail delivery, and agricultural purposes. Cierva's autogiros gained acceptance within the aviation community and the Cierva Autogiro Company began to sell build rights of Cierva Autogiro’s. It must be noted that the word Autogiro was a tradename of Cierva’s windmilling rotary-wing aircraft. Soon these new companies under license of Cierva began to further develop the design and refine it into a true working aircraft. Among these developments, conducted by Cierva, Pitcairn, Wier, and others was various means to mechanically versus physically prerotating the rotor blades. A very important element of providing direct pitch control to the rotor was also developed. It should be recalled that previous control of the aircraft was accomplished with regular flight control surfaces as utilized in fixed-wing aircraft. The ability to directly tilt the rotor gave the autogiro even more control responsiveness especially at slower aircraft speeds. Further advances in the design lead to “jump take-off” capability and a means to move the mast in flight for added stability. The preceding features were incorporated over various Cierva models over the years and culminating in the design of one of the most widely recognized autogiro’s in the world the C.30. This aircraft was produced in good numbers for both military and civil use. Varients of this aircraft were built by Focke in Germany and by Kayaba in Japan. Other well-known companies producing Cierva autogiros at the time include but not limited to Westland, Avro, De Havilland, Comper as well as designs being produced in France and Russia. It appeared that the company was doing quite well and that the future of Cierva Autogiro Company would become a force among the aviation industry. My many thanks to Ed,"Bomberguy", for allowing the use of this great video. At the outbreak of the Spanish Civil War (July 17, 1936 to April 1, 1939) , De la Cierva supported the forces of Francisco Franco, helping the rebels to obtain the De Havilland DH-89 'Dragon Rapide' which flew General Franco from the Canary Islands to Spanish Morocco. His brother was executed by the Republican army in Paracuellos del Jarama. In a very ironic twist of fate the man who spent the better part of his life to develop a safe aircraft would loose his own life in an aircraft accident. On the morning of 9 December 1936, de la Cierva boarded a Dutch DC-2 of KLM at Croydon Airfield, bound for Amsterdam. After some delay caused by heavy fog, the airliner took off at around 10.30am, during take off it stalled and crashed on the roof of a building at the end of the runway and burst into flame. At the time, it was the single worst aviation accident in British history. The importance of Cierva’s work on rotors and the effect upon the evolution of the helicopter cannot be overstated, and is indeed recognised throughout the industry. 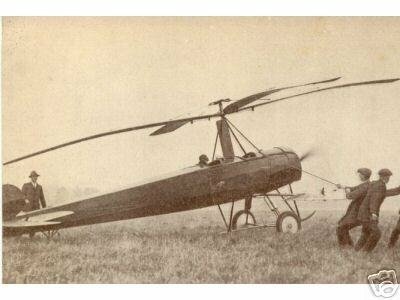 In the process of creating the Gyroplane (Autogyro), Cierva established an understanding of rotor dynamics and control, which was applicable to all rotorcraft, and undoubtedly led to the realisation of the helicopter. Technology developed for the Autogiro was utilized by experimenters in the development of the helicopter, the first fully successful example of which, the Fw 61, was flown in 1936 by Cierva Autogiro Company licensee Focke-Achgelis. The Autogiro also led directly to the Cierva C.38 Gyrodyne, which utilized a powered rotor for hovering and low speed flight, and a side-mounted propeller for torque correction and propulsion in cruise flight. As airspeed increased, propeller power increased while rotor power automatically decreased which reduced rotor collective pitch to autorotative angle with the rotor remaining parallel to the flightpath. As airspeed reduced, propeller power decreased while rotor power automatically increased which increased rotor collective pitch to non-autorotative angles. 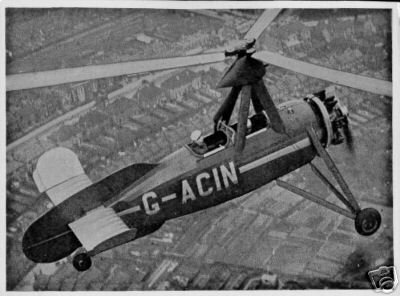 The Fairey Gyrodyne, first flown in 1948, established the superiority of this configuration over that of the helicopter, which De la Cierva consistently rejected as too mechanically complicated, even though he agreed with the requirement for hovering performance. After Juan de la Cierva’s tragic death in the crash of a KLM DC2 at Croydon Airfield on December 9, 1936, many who had known him rendered tributes to his vision. Where and whenever the pioneers of aviation are celebrated, Juan de la Cierva’s name is enshrined. He is one of the few in history of whom it can be said that what he and envisioned changed the world. 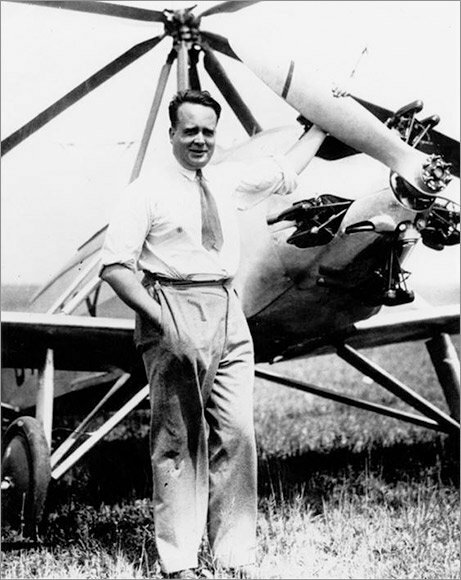 Certainly an entire website could be devoted to aviation pioneer Juan de la Cierva. His buisiness skill, engineer genius, piloting skill and devotion to flight safety are all topics which can be much further commented upon than the confines of this site. Juan not only invented a product to bring to market but continued to improve upon his design to provide greater performance and handling. With Cierva came the life of the autogiro and with his death also the beginning of the end of the autogiro for after only a few short years the autogiro fell from public eye as helicopters began to rule the realm of vertical flight. Fortunately, Raul Hafner's (Cierva Liscensee) Rotachute would inspire Igor Bensen to design the new form of autogiro into the modern gyroplane. Funny how we must go back to our roots to further progress our advancement in aviation, much like Burt Rutan with his canard design, today we stand on the brink of new machines and technology that was being investigated back in the time of Cierva. Today, 2008, there is the Piaseki test aircraft that is a modern version of the goals of which Cierva was striving for in his rotorcraft designs. Sikorsky is also investigating the benefits of autorotational flight with their new research aircraft. As well as Jay Carter Jr. with his slowed rotor concept. All ideas that were being evolved by the Cierva Company back in the late 1930's. These new designs are showing promise of speeds near that of regional. commuter, speeds and opens a whole new door for vertical flight. It is doubtful the helicopter will disappear but the new designs may offer greater speed, range and economy over a variety of uses and operate at a much lower expense. Cierva still continues to inspire and awe us today with his aeronautical genius. I personally owe a great debt of thanks to Bruce Charnov for his valuable contribution to this tribute. Dr. Charnov's great insight in the life of Cierva and also for providing the photographs used on this page. A leading authority on autogiro history and development. It has been both an honor and pleasure to work with this fine individual. Thank you Bruce for your involvement in a fitting tribute to the founder of our industry. www.greenwood.com - search terms From Autogiro to Gyroplane.